When friend and fellow blogger, Amanda Richardson gives me books of hers to read, I always know I'm in for a treat. I gladly accepted this one in return for an honest review. Thanks, Amanda! Charlotte Bloom is an everyday woman. 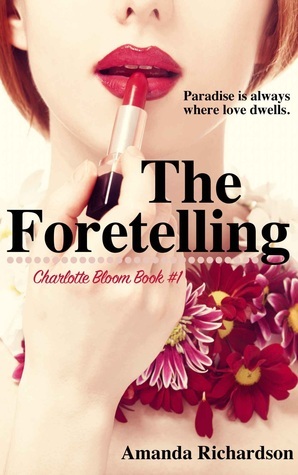 Struggling with infertility, a loveless marriage, and that all around feeling of being lost, Charlotte does that crazy thing we all want to do sometimes. She threw herself on the first plane she could find to Europe. I love a good female protagonist that isn't perfect, but realistic and relatable. I was sucked into her life, and even when her marriage crumbled and she whisked herself away to Wales, I wanted Charlotte to take me with her. I was on her side the whole time. I was a fool for the setting in Wales. The family-run hotel, the lovable staff and the local villagers. I picked up the book every day just wanting to go back to that place that felt so homey and wonderful. Add Irish groomsman, Alec. Done for. What I loved about this story was that it was a romance, but it wasn't a super cliche romance novel. The male love-interest was multi-layered and interesting (and hot). A modern day Mr. Darcy, he was a bit of pill for the first half of the book, but a super hunky, lovable pill. I loved his relationship with Charlotte and digging deeper into what made him tick. If I had any complaint, it was that I wanted more. More Alec, all day. I cannot wait to read more of Charlotte's adventures and that delicious romantic tension with Alec. Amanda has a way with creating characters that feel so incredibly real that it's hard not to get attached. Thanks for sharing your article. Do you require an amazingly dire paper of high quality?only best essay writing service that can deal with such weight! Luckily, you can arrange paper at this site! costs are straightforward, so you can undoubtedly perceive how much your undertaking is going to cost before finishing the request structure.